"un buen trabajo de artesanía, llenó mis espectativas y llegó bastante rapido;..."
12 mm round beads of carnelian. 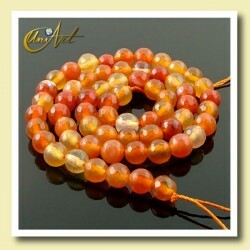 Measures of carnelian round beads string: · String with about 40 cm in length. · Contains 31 faceted round beads of carnelian and weighs 75 gr. approximately. Round beads of carnelian, size 10 mm. Carnelian round beads in strands for making jewelry and costume jewelry, measuring approximately 40 cm. 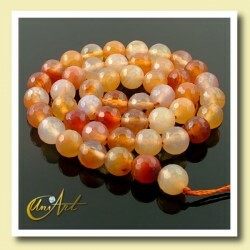 Strands are composed of, on average, 39 faceted carnelian round beads and weigh about 38 grams. 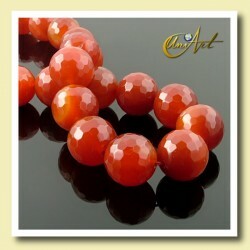 8 mm round beads of Carnelian to manufacture jewelry and costume jewelry. 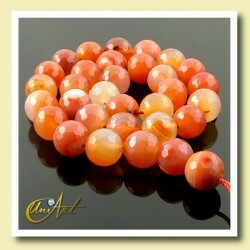 Carnelian is a kind of agate, its color can be from light orange to red. Approximate measurements of each strip carneola: 40 cm long. Weight 35 gr. Containing about 48 balls. 6 mm round beads of Carnelian to make jewelry and costume jewelry. Carnelian is a type of agate, its color can vary from light orange to red. Approximate measurements of each strip carneola: 40 cm long. Weight 22 gr. Containing 66 balls. Strings of 6 mm faceted carnelian beads. The Strips are 40 cm long and about 20 grams. 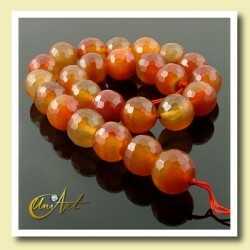 Each one brings on average 63 faceted carnelian beads, for make jewelry and costume jewelry. Faceted round beads of carnelian, size 8 mm in strings. Faceted carnelian beads in strings for making jewelry and costume jewelry, measuring approximately 40 cm. 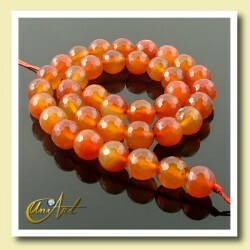 They are composed of, on average, 47 faceted carnelian beads and weigh about 35 grams. String of 10 mm faceted round beads of Carnelian. Measures: · 40 cm of long approximately. · Contains 38 faceted round beads of Carnelian and weighs 50 gr. approximately. 12 mm faceted beads of carnelian. Measures of carnelian faceted beads string: · String with about 40 cm in length. · Contains 31 faceted round beads of carnelian and weighs 80 gr. approximately. 14 mm round faceted beads of Carnelian. Measures: · String with about 40 cm in length · Strings faceted carnelian beads in average containing 27 balls and weigh 100 gr. approx. Strings faceted carnelian beads size 16 mm. Strips are 40 cm long and about 125 grams and bring on average 23 faceted carnelian beads, ideal for jewelry and costume jewelry. Faceted carnelian beads size 18 mm in strings. Faceted carnelian strings for making jewelry and costume jewelry, measuring approximately 40 cm. They are composed of, on average, 22 faceted carnelian beads and weigh about 145 grams. 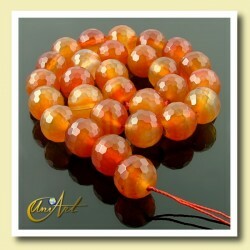 Carnelian beads in lentil shape 10 mm. Measures: · String with about 40 cm in length · Contains 56 beads and weighs 58 gr. approximately. · Each bead measures 10 mm x 7 mm.